With her House of Sussex enterprise, Susie Coelho debuts a vivid ensemble of leather backpacks at D Gallery in Palm Desert that wonderfully blends art and fashion. Susie Coehlo has created products that marriage art and fashion. It’s hard not to be inspired by the likes of Bansky, Basquiat, Lictenstein and Harring. Or, for that matter, the vibrant street art that permeates modern culture today. What is hard, perhaps, is taking the brilliance of said street art and transferring it onto products that maintain an artist’s creative integrity. Susie Coelho has done just that — with aplomb. It’s all on display in the multimedia lifestyle guru’s latest endeavor, The House of Sussex, which the former valley resident and former wife of the late Sonny Bono, launched last year. The company, which was named after Coelho’s birthplace in Sussex, England, is a dream for fashionistas near and far, and anybody who digs the marriage of art and fashion. 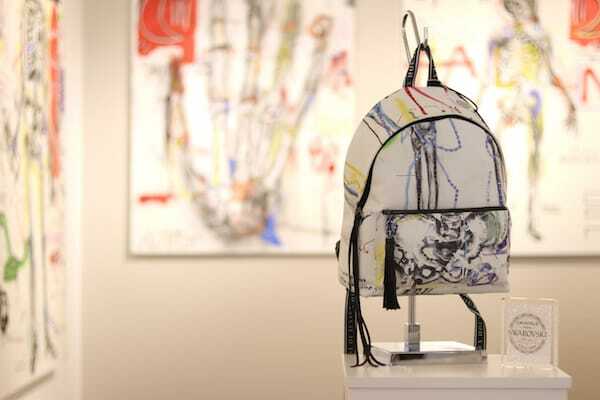 One of the company’s main offerings is premium leather backpacks that are also memorable works of wearable art. They’re available at D Gallery in Palm Desert through the end of April—perfect for the Coachella crowd and beyond no doubt. 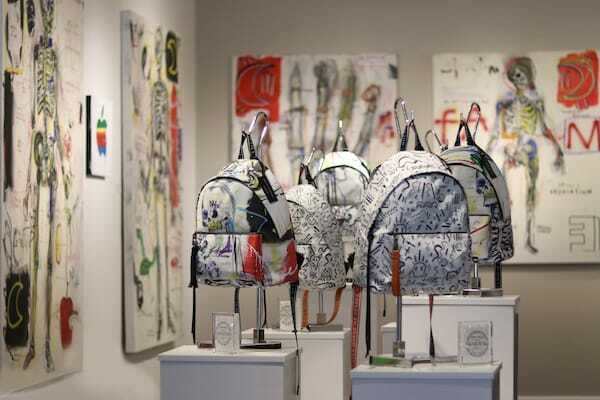 Susie Coelho’s House of Sussex backpacks are on exhibit and for sale at D Gallery in Palm Desert through April 30. By the looks of it, Coelho and crew have succeeded. Produced by an in-house team, the lightweight backpacks are comprised of the finest Italian leather. The backpacks also sport hip themes and monikers. 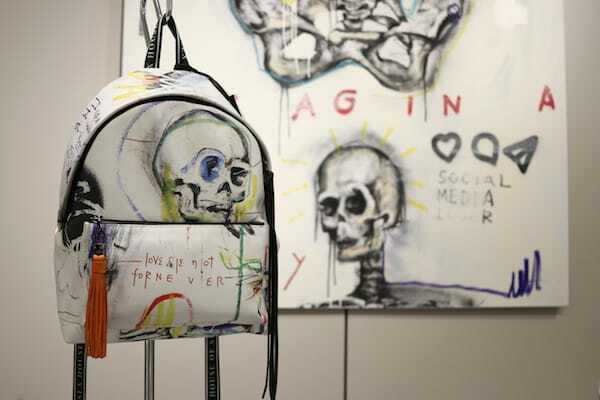 “Anatomy of the Modern Us,” for instance, features an eye-popping “Eve—Temptation Backpack,” showcasing portions of a skeleton against a mod backdrop of swashes of yellow, blues and charcoal. The “Adam—Forbidden Backpack” goes for fringe with similar accents featured on “Eve” but with a splash of deep red. “Anatomy of the Modern Us,” features an eye-popping “Eve—Temptation Backpack,” showcasing portions of a skeleton against a mod backdrop of swashes of yellow, blues and charcoal. Meanwhile, “the Studio Collection” showcases orange or black or black fringe features. There’s more eye-candy: Crystals from Swarvoski are embedded into the backpacks and collaboration with California-based contemporary artist Louis Carreon is just as bold. 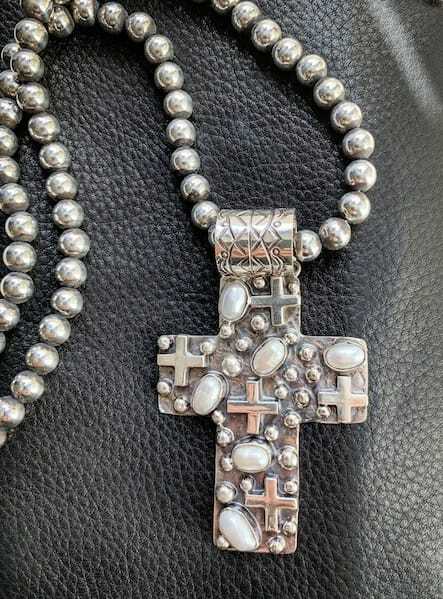 Susie Coelho’s sterling silver crosses, this one sporting fresh water pearls, are downright unique. The appreciation deepened when Coelho lived in Los Angeles, particularly in the 1980s when she played an art teacher in the breakdance film Breakin’ 2: Electric Boogaloo. At the time, she found herself surrounded by young East L.A. artists. She’d later spray-paint her clothes and sell them as collectibles. About nine years ago, she became enamored with New York City’s street art and so began the geneses of The House of Sussex. As for what Coelho loves most about what she’s doing in her life at the moment — running a bona fide enterprise that spans television, books, products, art and fashion — she gives props to a deep desire to continue being creative. As an ‘artist,’ when you work in the creative world and have done so your entire life, the creative process is what drives you,” she says. “It’s the passion, not so much the ‘thing’ that makes you do it. For most of my career that’s been the case—with writing, with being a model, to creating and running a restaurant. Susie Coelho’s House of Sussex backpacks are on exhibit and for sale at D Gallery, 73111 El Paseo #101 in Palm Desert, through April 30. They will also be spotlighted in a special event (“Rock and Roll is Not Dead — Alive and Wells”) at the galley from 4-10 p.m. April 18. For more information, visit dgallery.me, susiecoelho.com or thehouseofsussex.com.